Updated 06.13.2018. 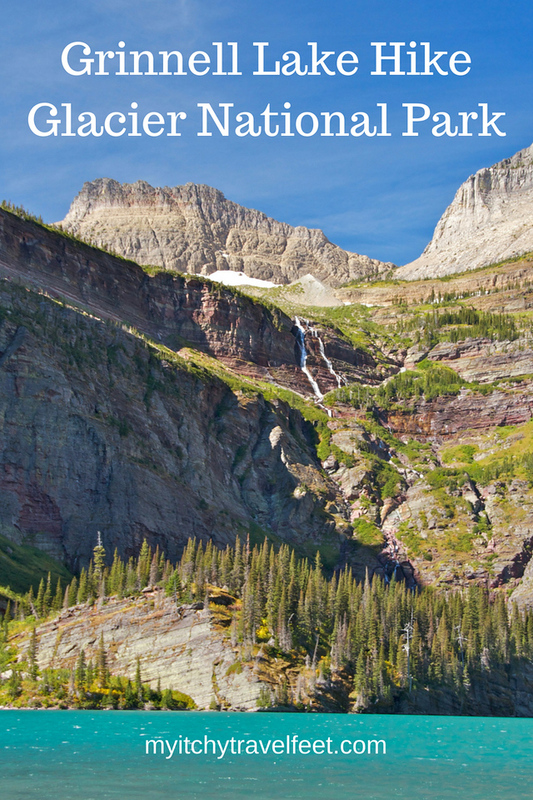 In June 2014, I wrote about one of the most beautiful hikes in Glacier National Park. In my latest update, I’ve included answers to frequently asked questions about the trail to Grinnell Lake, more photos and updated hiking information. 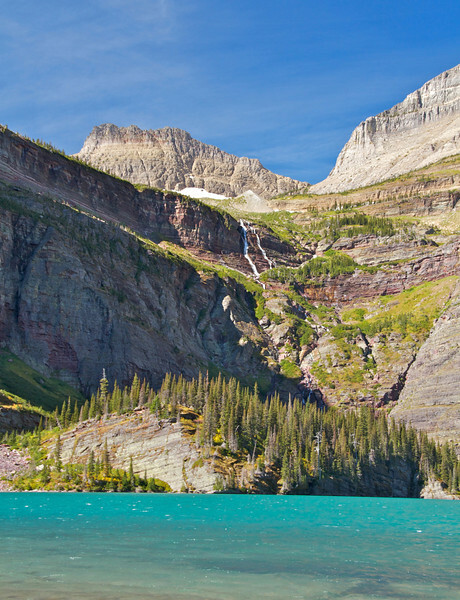 The Grinnell Lake hike is one of the most beautiful trails in Glacier National Park. Most hikers visiting the Many Glacier area of Glacier National Park in Montana come to experience the Grinnell Glacier Trail or trek to Iceberg Lake. After all, Many Glacier has some of the best hikes in Glacier National Park (in my opinion). But the Grinnell Lake hike offers a beautiful experience, too, especially if you’re looking for a less strenuous Glacier National Park hike. You’ll still catch a glimpse of a glacier, although it’s Salamander rather than Grinnell. And there are two options for getting there—the easy way via the Glacier Park Boat Company—or the hard way hiking the entire journey (6.8 miles) on your own two feet. Of course Alan and I chose the hard way to reach Grinnell Lake as part of a Glacier National Park Hiking Program with Road Scholar. Accompanied by guides, Lori and Stephanie, we left Many Glacier Hotel (read ourMany Glacier Hotel review here) on a morning hike that accessed the trail to Grinnell Lake on the south shore of Swiftcurrent Lake. For the first mile or so of the hike, we shared the trail with horses, which meant watching closely where we stepped. Next time, I’d choose an alternative to this portion of the trail (and there are several). Once the horse trail veered away from our path, the hike to Grinnell Lake became an enjoyable, mostly level, walk in the woods. The trail follows the shores of two subalpine lakes—Swiftcurrent and Josephine—with several opportunities to step off-trail for taking photos of glacier-fed waters. On one portion of the trail, as we walked single-file along a slightly muddy path enclosed by trees, a “shh-shh” passed down the line of hikers. What did those ahead of us see? Two moose eating a breakfast of shrubs and tree leaves. By the time it was my turn to observe, the moose had moved deeper into the forest and were only slightly visible, but I could hear them chomping away. Moose are loud eaters! This trail is known for its wildlife sightings, including grizzly bears, moose and bighorn sheep. Park guidelines recommend keeping at least 100 yards away from large wildlife for your safety and theirs. Carry bear spray. Our tour guides both had cannisters, just in case. Not a bad lunch view, eh? The trail becomes busy near the boat dock closest to Grinnell Lake. If you arrive at the same time as the boat, you’ll be joined by those who chose the easy way to Grinnell Lake. However walking across the cable bridge that crosses Cataract Creek is a bouncy journey that everyone must take to reach the lake. When our group arrived at the lake, frigid winds whipped off Grinnell and Salamander glaciers making for a slight chop in the water. On this September day, it was too cold to go wading, but Alex Neill from Montana Vacation blog braved the waters during a summer visit and declared them, Cold! The wind forced us to take shelter on a couple of logs behind a screen of vegetation. It was still a beautiful spot to enjoy the sack lunch that had been provided by Many Glacier Hotel and Road Scholar. For those looking for more solitude, be patient. The boat hikers usually stay a few minutes and then leave, and the quiteness quickly returns. On the return hike, our group crossed a bridge at the end of Josephine Lake to hike on the north side of both lakes. This more open terrain offered sunlight and good views of the lakes although we were walking with the sun shining into our faces—the wrong direction for good photography. For better photography, and to avoid hiking with the sun in your eyes, start this hike in the morning on the north side of the lake and return on the south side. As we moved down the trail, one of the Road Scholar lectures from earlier in the trip came to life for us. Researchers have placed patches of barbed wire on trees so that when grizzlies scratch against the wire, fur is collected to use for DNA testing. This helps determine the family relationships and movement patterns of grizzlies in the area. Stephanie stopped at a tree to point out one of the barbed wire collection sites. Yes, there were small strands of grizzly fur on the ends of the wire. Later, we passed a research assistant collecting the hair to take back for testing. Many Glacier Hotel as seen from the trail. Taking the trail between Josephine and Swiftcurrent Lakes, brought us back to the south shore. In the process, the grand view of Many Glacier Hotel provided lovely photo opportunities. Curious about staying in this historic lodge? Read our review. Hiking the Grinnell Lake trail proved to be a pleasant morning in the woods. I recommend it as a Many Glacier get-acquainted-hike. It’s also an easy hike to do on a rest day between two harder days of hiking to Grinnell Glacier and Iceberg Lake. How do I get to Grinnell Lake Trail? Grinnell Lake is located in the Many Glacier area on the east side of Glacier National Park. 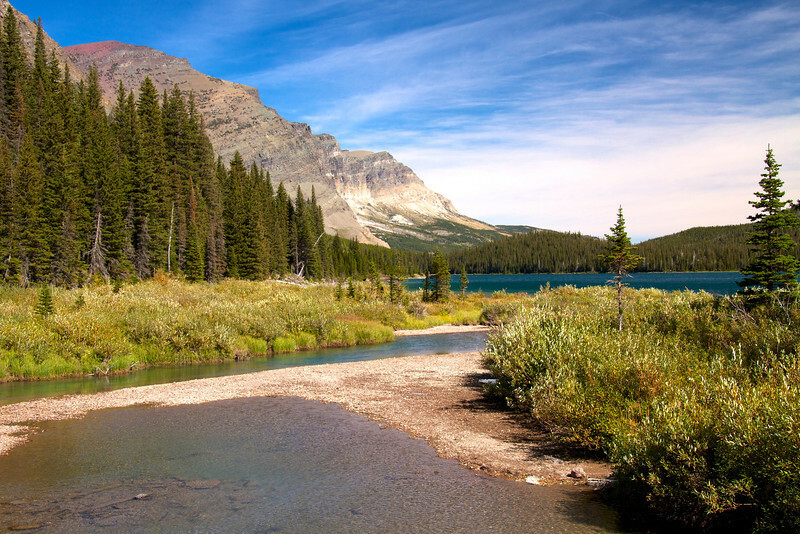 It’s one of the prettiest spots in all of Montana—and the park. I recommend spending the night at Many Glacier (keep reading for more lodging suggestions), although hikers can drive in from St. Mary’s in East Glacier or West Glacier. However you’re looking at a very long day. Many Glacier deserves so much more of your time considering the many hiking opportunities. Have you read about the hike to Bullhead Lake? My favorite! You’ll find the trail to Grinnell Lake at the south end of Many Glacier Hotel near the Swiftcurrent Lake shoreline. The trail travels near subalpine lakes and through dense forest that attracts plenty of wildlife. It’s also buggy. Bringing bug repellant and bear spray is a must. Pack a snack or lunch to enjoy as you sit on a log by the lake. And, by all means, bring your camera for photographing one of the most scenic trails in Glacier National Park. Will you need hiking poles (check current prices here)? Not really. I always bring them but the trail is level enough that you really don’t need them. Wear layers when hiking in Glacier National Park. In this photo, I wore a fleece jacket over a long-sleeve hiking shirt over a base layer. What do I wear when hiking to Grinnell Lake? Layers, layers, layers. Seriously, the weather in this part of Montana is changeable. Yes, it can snow even in July and August, although rain is more likely. And much depends on the time of day that you’re setting out. Even in warmer weather, hiking pants and long sleeve shirts are a good deterrent against insects. When is the best time to hike to Grinnell Lake? As boomer hikers, Alan and I prefer morning hikes when our energy level is highest. Plus there are fewer people on this moderately-used trail at the start of the day—and more wildlife. In the summer, an afternoon hike to the lake would be fun, too. But watch out for the bugs! And the best time of year? June through September are the best months for this hike. But if you’re planning on using the boat shuttle for part of the journey, it may not be running in May or mid to late September, so check to see if the boats are operating. The Many Glacier Road generally opens from late May to late September but it’s always best to check operating hours with the National Park Service. Do I need a guide for the Grinnell Lake trail? This trail is perfectly doable on your own. Considering the amount of wildlife, especially bears and moose, frequenting this area of Many Glacier, hiking when other people are around is a good safety measure. Booking a ranger-led hike is an excellent option. He or she will be carrying bear spray plus know what to do if a bear or moose crosses your path. You’ll also learn much about the flora, fauna, geology and history on a guided hike. Taking photos is part of the fun. What are the trail highlights? Scenery and wildlife make the Grinnell Lake trail a very special one. You’ll be walking through a dense, evergreen forest with glimpses of lakes until reaching Grinnell Lake. There’s also a spur to Hidden Falls near Cataract Creek. On the return trip, if you cross over Josephine lake to the north side, you’ll be hiking in more open terrain. On a sunny day, wear a hat! 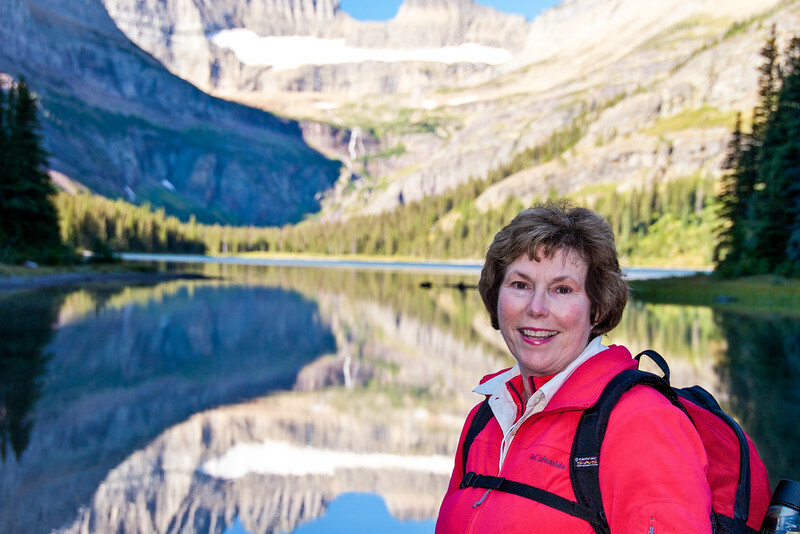 Grinnell Lake is a great choice for active boomer travelers. By adding a boat ride, the hike becomes doable for those who are only capable of a short hike. I’ve read reports of icebergs floating in the lake but that was not the case on our September visit. 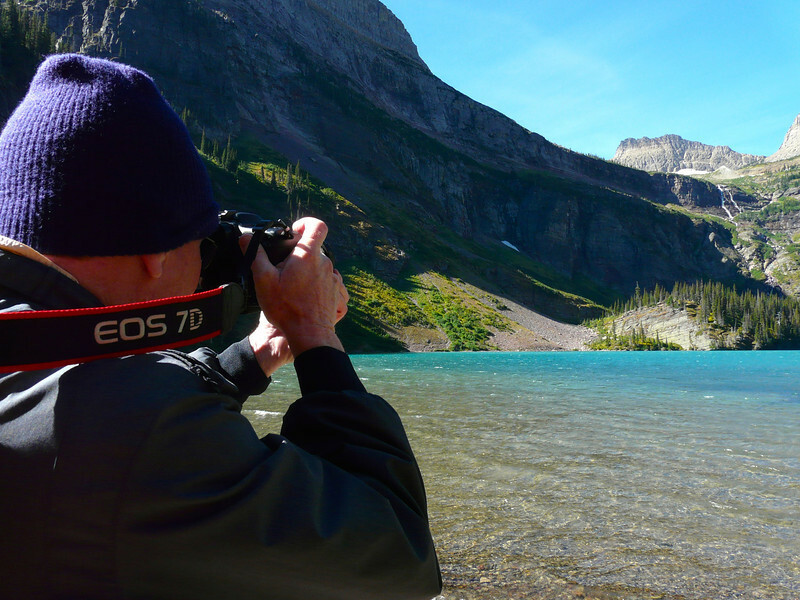 Known as one of the most scenic spots in Glacier National Park, you’ll definitely want to bring a charged-up camera with plenty of room on the memory card during a Grinnell Lake hike. 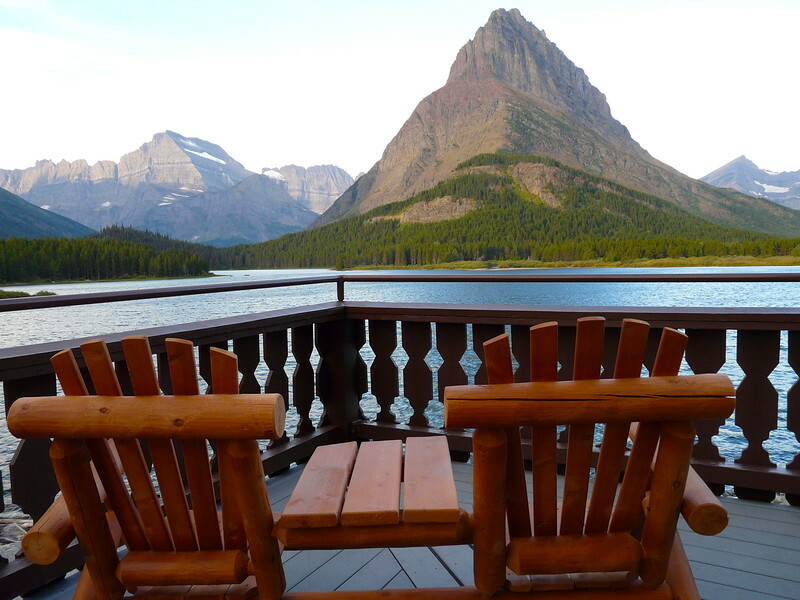 Relaxing on the deck of the Many Glacier Hotel is the bonus at the end of a Grinnell Lake hike. Where should I stay in Many Glacier? 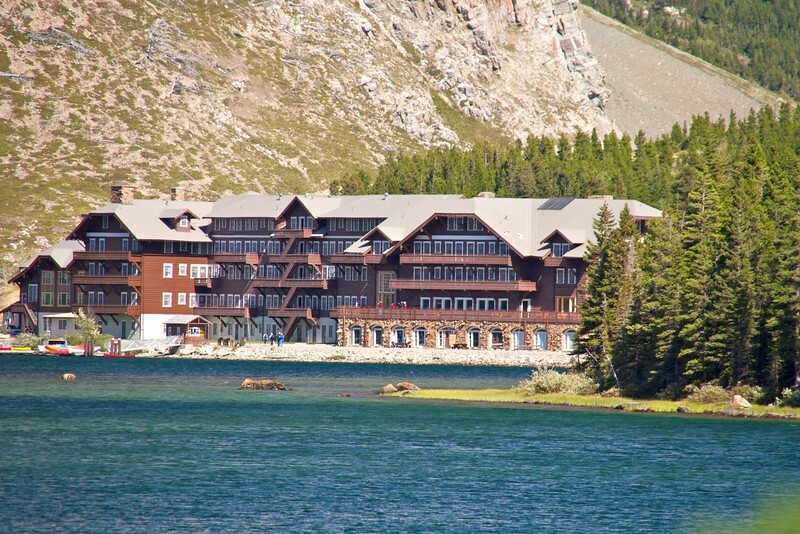 To experience historic national park lodging, Many Glacier Hotel offers a lakeside setting that’s steeped in history. Swiftcurrent Motor Inn and Cabins provides a more budget-friendly alternative. You’ll find restaurants at both choices. Make reservations well ahead of your trip as rooms book up fast, sometimes a year in advance. 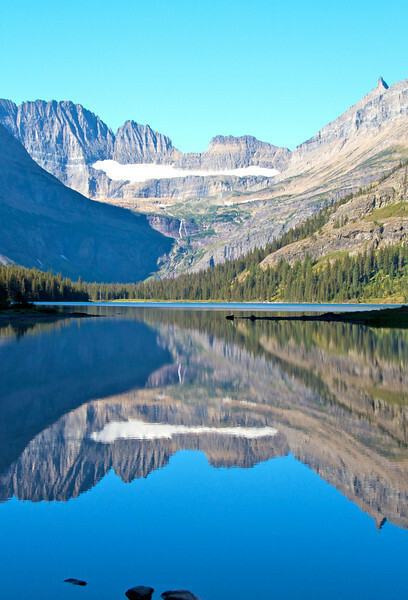 Planning a trip to Glacier National Park? Start with our National Park Travel Planner. 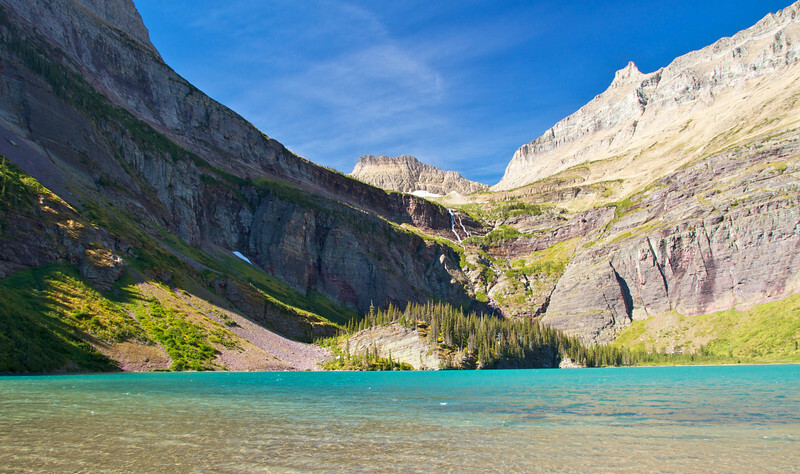 Have you hiked to Grinnell Lake? Come join the conversation at the My Itchy Travel Feet page on Facebook. Or send us an email with your thoughts.